Nyx is such an amazing and affordable brand. I've been a huge fan of their products for years, especially their colourful palettes. As soon as I layed eyes on the In Your Element Water Palette, I was sold. I own a few palettes with different shades of blue, but have yet to find one that's jam packed with gorgeous powder blues, deep blues, stunning turquoise shades and bold shimmers....until now that is. Lets dive into these rich shades! I get serious mermaid vibes from the packaging on this palette, it looks so good in my collection. It's made from a hard plastic, feels very durable and they've executed the water theme perfectly with the bubbles, blue spots and a bit of a pink haze. This palette has 12 shades with a net weight of .05 grams each, 2 of which are matte and the rest are glitter and shimmers. Nyx created a six palette collection including Earth, Wind, Fire, Metal, Air and of course Water. I have blue eyes and usually blonde hair (sometimes pink) and thought the Water palette would make an exceptional addition, I was not wrong! Let's move onto some vibrant and rich swatches! I mean, how stunning are theses shades?! 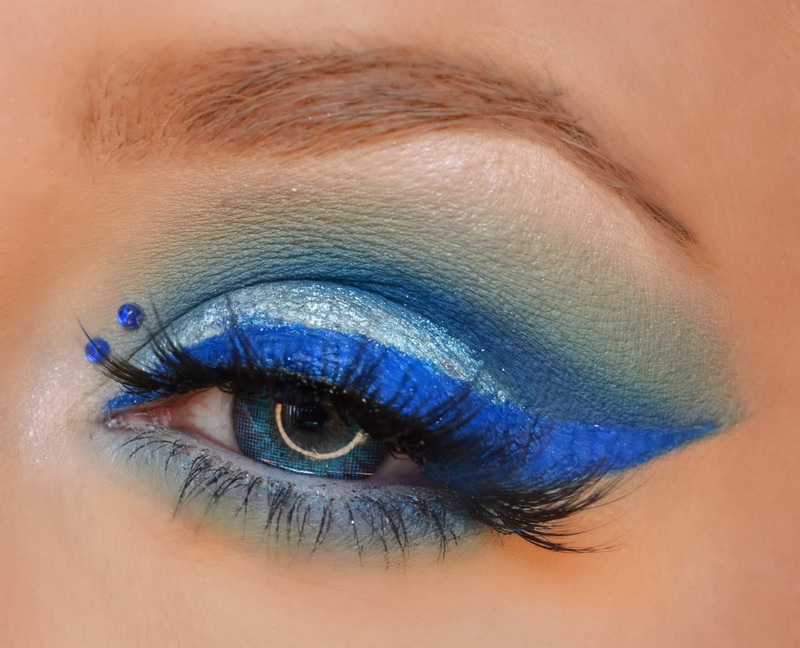 If you're into blues and pop's of colour, this palette is perfect for you. I had to throw my favourite Nyx white liquid liner in there as well, it works great as a base for a vibrant blue eyeliner! These aquatic colours swatch beautifully and I absolutely adore their touch of duo chrome (bottom right, shade 12) it has an aqua shimmer which is accompanied by a brown base, my photos don't do it justice! Shade two is more of a chunky glitter where as the rest are more finely milled. It's so refreshing to be able purchase vibrant palettes without them being full of neutral shades, the rest of this 6 palette collection is on my "must-haves" list. I was pleasantly surprised with each blue-toned shade, more often than not when trying blue colours I notice difficulty while blending. That was not the case, they all blended out seamlessly. Fallout did occur, but nothing that a quick wipe wouldn't fix.